I bought this drill so I could do some masonry work, before I could use it I ran into one small problem. I had no idea how to put the chuck key on the key holder that is supposed to be attached to the electrical cord. This shouldn’t be so complicated and well it turned out not to be after I looked up some instructions that confirmed what I was thinking. Honestly I think a picture solves the problem immediately hence this post. I categorize this as being slightly obscure, it isn’t much of a gotcha. Do NOT put the key onto the holder yet! 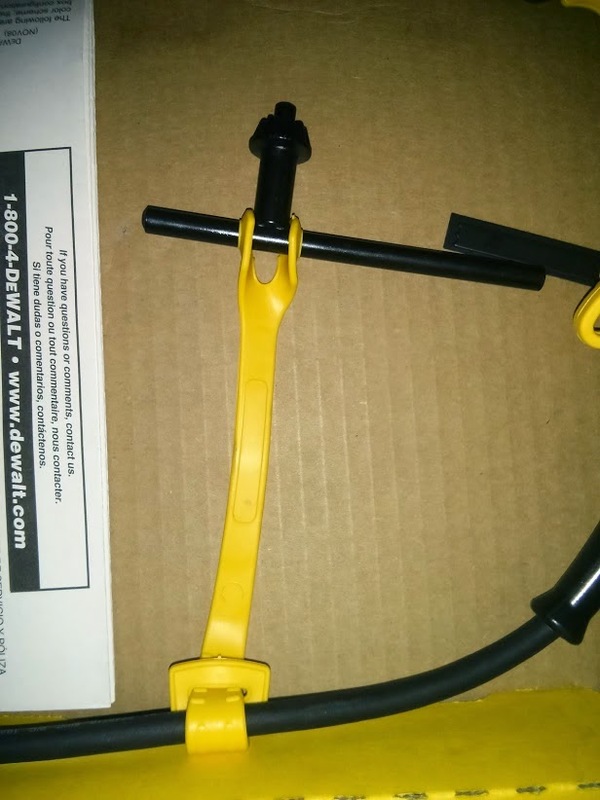 First wrap the band (yellow rubber key holder strip) around a portion of the electrical cord wherever you want. I put it towards the grip/handle because that is where I like it. Feed the “Y” portion that has the two holes in it through the fatter square slotted portion. This most easily done by folding the “Y” on itself which will align the holes together and shove them through the slotted portion. This isn’t super easy, so just keep at it until it gets through. When you get the “Y” portion through pull it all the way down to the ribbed portion to lock it into place and wrap it around the cable snugly – do not overtighten. Place/force the long end of the key into one of the holes of the “Y”. The hole is definitely too small, just force it through (stop giggling). Place/force the short end of the key into the remaining hole of the “Y”. You may have to stretch it a little to make this work – just take your time. What you did should look like what I did in the image above. If you are wondering – yes I like this drill. It works very well and cuts down the time to drill into concrete blocks to seconds. I was putting 3 and 1/4 inch Tapcons into concrete blocks. I & hubby want to thank you very much for the picture and instructions. It really helped! I have to admit, I was to embarrassed to ask this question. If you do a google search though this comes up before you even type Dewalt in the search bar, so apparently we’re not the only ones. That’s why I make these articles. If I can’t find the answer online, I figure it out myself then post it. Thanks for your comment.